The congressional township of 135, range 36, was organized as the civil township of Bluffton on July 17, 1878. The commissioners ordered the first election to he held at the house of William S. Hurst on August 5, 1878. The petition presented to the commissioners was signed by seven-teen of the qualified electors of the township, as follow: W. A. Walker, Patrick Burns, W. S. Hurst, Dennis McCortez, G. W. Rice, C. M. Maltby, G. W. Handy, Joshua Winter, Peter Nelson, John Q. Ostrander, James E. Ostrander, Royal P. Ostrander, S. McGuire, Daniel Philips, Ames Philips, John Anderson and John Shoborg. Bluffton township lies on the extreme eastern side of Otter Tail county. It is bounded on the north by Blowers township; on the west by Newton; on the south by Compton; and on the east by Wadena county. This is one of the few townships in this county that does not contain a lake within its limits. This township has good drainage because of many streams which flow through it and these streams afford ample means for natural and artificial drainage. The general slope of land is to the south and east. Leaf river enters this township on the southern side, a mile south of Bluffton, and meanders northeast until it reaches a point one mile east of Bluffton, where it flows due east entering Wadena countv from section twenty-five of this township. Its tributaries are Mill creek, which lies almost wholly within this township and affords excellent drainage for the eastern half of the township and North Bluffton creek which flows across the northwestern corner of the township and then enters Newton township, flowing in a southern direction until it again enters Bluffton township in the northwest corner of section thirty. It then flows in a small body of water on the western side of the town of Bluffton which is then emptied into Leaf river. The Northern Pacific runs through the southern part of the township, entering at Wadena Junction and leaving it at the southwest corner of section thirty. There are just five miles of track of this railroad in Bluffton township. The building of this railroad in 1871 through this section of the county was responsible for the settling and organizing of this township at an early date. The village of Bluffton is located in section 33 of Bluffton township and is the only village in the township. The Northern Pacific, which runs across ,the southern part of the township, is responsible for the location of the village. It was platted by A. M. Darling for the proprietor, C. M. Maltby, in the spring of 1880 and recorded on the 27th of March of that year. In the winter of 1902-03 the village waged a successful campaign for incorporation. 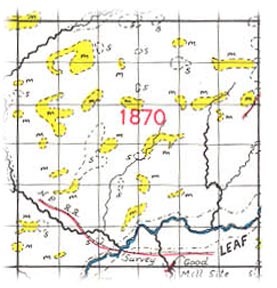 On December 26, 1902, they took a census of the village and found that there were two hundred and thirty-three inhabitants in the territory seeking to be incorporated. On January 10, 1903, a petition was presented to the commissioners asking for a special election to ascertain the sentiment of the voters regarding incorporation. The petition was signed Iver Johnson, Joseph Yunch, Matthias B. Klein, Peter Klein, C. M. Klein, Bernard Kluenenberg, M. P. Hammer, William S. Gray, Peter Lorge, J. M. Pallauch, John Ostlund, John C. Jones, Reinhold Langer, Ernest Pilger, John Goeller, John Endre, Hubert Welsch, E. B. Beighiey, Charles Kupper, Rubert Arbuckle, Joseph Barth, James M. Howes, William Pilger, Nicholas Lick, Mary Beighley (widow), Jess Hoppes, Flora Boldon (widow), Bernard Hentger, J. E. Erickson, Leonard Geiser, Peter Paggen, John Triesch, J. W. Kramer and A. T. Kramer. The board granted the petition and set February 24, 1903, for the election. A total of forty-six votes were cast, of which thirty-two were for and fourteen against the proposed incorporation. Bluffton lies four miles northwest of Wadena and, although lying in such close proximity to a town which is much larger, this has not succeeded in keeping down the growth of this town. The population at present is about five hundred. There is one hotel, a bank, creamery and grain elevator. The Catholics have the only church in the town. R. M. Stuntebeck is the present postmaster. The present village officers are as follow:	President, Jos. Ahles; trustees, John Regan, M. B. Klein and Jos. Geiser; clerk, J. A. Otte; treasurer, Anton Raykowski; justice, G. A. Howes; constable, Kaufmann. Places of birth for Bluffton Township in the 1905 state census.